Speed: DDR2 2RX4 800MHz. Capacity: 4GB. Item picture Shown only. actual item may various. We will reply you as soon as possible. Specs: DDR4 PC4-21300 ,CL=19 ,Unbuffered ,NON-ECC ,DDR4-2666 ,1.2V. Samsung DDR4 DIMMs Product Highlights. Total Kit Capacity: 16GB (two 8GB sticks of M378A1K43CB2-CTD). Component for desktop PC`s. Series: Samsung. 16GB (2x8GB) Samsung PC3-12800U DDR3 1600MHz Desktop RAM. P/N M378B1G73QH0-CK0. Type DDR3 SDRAM Brand Samsung MPN Does Not Apply Number of Pins 240pin Bus Speed PC3-12800 (DDR3-1600) Total Capacity 8 GB Number of Modules 2 Capacity per Module 4 GB UPC Does not apply. Taken from workinng pc fully tested. 240pin DDR3. 4GB 240pin DDR2. 204pin DDR3. ECC Server RAM. Hope you can understand. 260PIN DDR4. Non-ECC,Unbuffered. 200pin DDR2. Manufacturer: Samsung Part Number: M393B2G70QH0-YK0 Warranty: 6 Months Shipping: Free Fed Ex ground or USPS shipping. These modules are compatible with any desktop which supports DDR3 RAM. Dell Optiplex, Lenovo ThinkCentre, HP Elite and ProDesk, ASUS, etc. 240pin non-ECC desktop RAM. Samsung M378B5273DH0-CH9. We have multiple kits available. 4GB Kit (2x2GB) DDR2 800MHz FBDIMMs for Apple Mac Pro. 4GB Kit (2x2GB) DDR2 PC2-6400 800MHz FB-DIMMs for Apple Mac Pro. - PC2-6400 / 800MHz. - 72-bit wide, Error Correcting Code (ECC). - 4GB Kit (2pcs of 2GB). · 204-pin DDR3: PC3-16000/PC3-14400/PC3-12800/PC3-10600 & PC3-8500 DDR3. 4GB(2x2GB) DDR3-1066MHz PC3-8500 Non-ECC Unbuffered CL7 DIMM 1.5V. Capacity 4GB(2x2GB). · 240-pin DDR2 & DDR3: PC3-16000/PC3-14400/PC3-12800/PC3-10600 & PC3-8500 DDR3 and PC2-8500/PC2-6400/PC2-5300 DDR2. They are used but are still functioning properly. Type DDR4 SDRAM Form Factor DIMM Brand Samsung MPN Does Not Apply Number of Pins 288 Bus Speed PC4-19200 (DDR4-2400) Total Capacity 8 GB Number of Modules 2 Capacity per Module 4 GB Model M387A5244BB0-CRC UPC Does not apply. Compatible with Dell Part number SNPX3R5MC/8G, A3078601. DELL POWEREDGE R410 SERVER. DELL POWEREDGE R510 SERVER. DELL POWEREDGE R515 SERVER. DELL POWEREDGE R715 SERVER. DELL POWEREDGE R610 SERVER. DELL POWEREDGE T610 SERVER. We are not responsible for item incompatibility. Actual item pictured. The SODIMM's shown are the exact ones you will receive. DDR3 1333MHz (PC3-10600). We will try our best to solve for your problem. Price is for QTY 1 while pictures show multiple. Fit for We will try our best to replay in 24hours! 4GB Total. 2 X 2GB PC2-5300 667MHz DDR2 SO-DIMM for Apple MacBook, MacBook Pro and iMac. This was pulled in a working system and tested. Great condition. Type DDR3 SDRAM Form Factor DIMM Brand Samsung Model M378B5173QH0-CK0 Number of Pins 240pin Bus Speed PC3-12800 (DDR3-1600) Total Capacity 8 GB Number of Modules 2 Capacity per Module 4 GB UPC Does not apply MPN Does not apply. • Capacity per Module: 8GB. • Type: DDR3 SDRAM. • Number of Pins: 240. Used lightly, tested working 100%. • Form Factor: DIMM. DDR3 SDRAM. Whether it's a laptop, desktop, LCD, printer or one of our other amazing deals, each piece is coming to you off-lease. As such, while the physical condition of the machine may feature small scratches or blemishes, each piece is in good working condition, ready to provide you the best experience possible. COMPATIBLE MODELS:2006, 2007 Apple Mac Pro (Model ID: MacPro1,1 & MacPro2,1). 8GB Kit (2x4GB) DDR2 667MHz FBDIMMs for Apple Mac Pro. 8GB Kit (2x4GB) DDR2 PC2-5300 667MHz FB-DIMMs for Apple Mac Pro. - PC2-5300 / 667MHz. 288pin DDR4. 260PIN DDR4. ECC Server RAM. 2GB 240PIN DDR2. 240pin DDR2. Non-ECC,Unbuffered. 200pin DDR2. 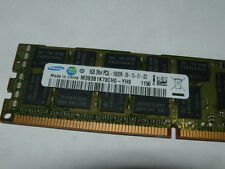 Description: M393B2G70EB0-YK0 Samsung 16GB PC3L 12800R DDR3 12800R 2Rx4 Dimm Part Number: M393B2G70EB0-YK0 Manufacturer: Samsung Capacity: 16GB Speed: PC-12800 Rank: 2Rx4 Type: DDR3 SDRAM Number of Pins: 240 Form Factor: DIMM Modules: 1 Compatible Systems: Servers Features: Registered ECC Disclaimer: Due to multiple Quantities, ram in photo could be different from the one received TESTED - Working Good to GO.